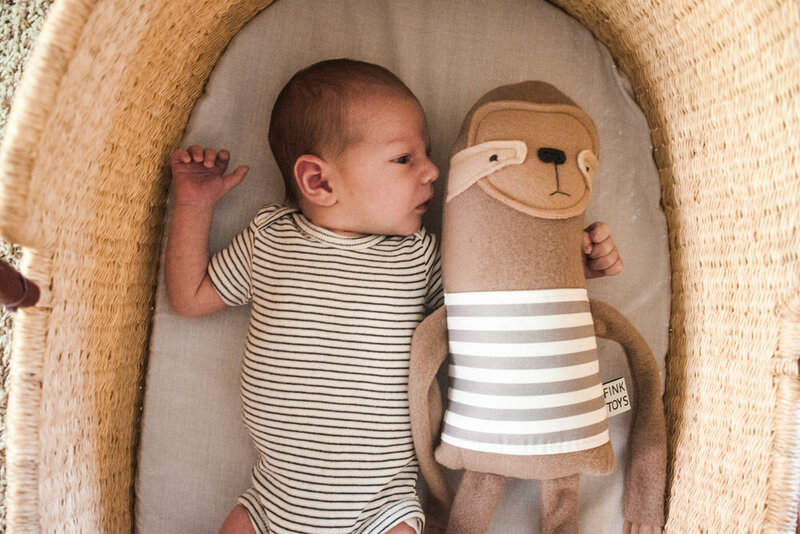 It's about time I officially introduced this scrumptious little boy to the blog. He'll be 8 months in a few days (ahhg!) and I can't believe he was this teeny-tiny, gangly thing not too long ago. (I took these pictures when he was just 5 days old!!!) Since then, he has grown 7 inches and gained 11 pounds. And my love for him has multiplied more times than I knew possible. David picked out the name Gideon - I wasn't on board in the beginning, but I didn't have any other names I liked more, so I didn't fight too hard against it. I've had an ongoing list of names since high school (I know, typical girl) but, strangely, none of them seemed right for my first little one. When we found out we were having a boy, I was really ready to give him a name so I could start to "get to know him" in a sense – I needed a name for that to be possible. Shortly after we found out his gender, I found an adorable cream-colored fleecy jacket while at a thrift store in Colorado and it got me so excited to meet the little boy who'd be wrapped up in it so soon. Now I REALLY wanted to pick a name, as I was starting to imagine what he would look like and what he would be like and I just couldn't wait any longer. A couple days later David and I were sitting in a coffee shop, playing cards when I decided it was time to settle the matter. I still had nothing better, so right then and there, we shook hands on it – he would be Gideon. Our first baby. Our first son. Gideon! Ever since that moment, I have fallen in love with the name. It is so perfect for him. It is so right. The story of Gideon in the Bible is special and unique, and I firmly believe that it will have significance for him as a man of God in the future. "The Lord is with you, mighty warrior." We had always planned on giving our first son the middle name Geoffrey, after David and his dad who both share that middle name. I was really excited about this, as I have always found it so special to carry a family name! Welcome to the blog Gideon Rans! We bought a big gold balloon to announce our news. Three months ago we became THREE! This ultra-ordinary event is something that never loses its charm. And in this case it's an even bigger deal because we are bringing the first grandchild into both of our families. I feel so honored to have this role. Oooo this baby is gonna be a spoiled little thang. In the past two weeks we have heard baby's heartbeat, seen baby on the ultrasound, and took a blood test to find out baby's gender. I think it's all starting to become a little more real. And I'm so happy to begin the journey of documenting and journaling all the wonderful times that are coming our way.